J&N Feed and Seed now stocks Dutch Ovens by Bayou Classic. The Bayou Classic Cast Iron Dutch Oven has a well established reputation for being the best cast iron cookware available. It has none of the roughness or pitted surfaces found on many typical cast iron pots that make them hard to season, difficult to clean & inconvenient to cook with. We stock a range of sizes including the 8.5, 12 and 20 quart cast iron pots. 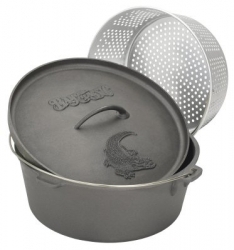 Each dutch oven comes with a cast iron lid with handle and a perforated aluminum basket. The dutch oven cast iron lid can also be used as a griddle. This entry was posted on Tuesday, October 22nd, 2013 at 4:49 pm	and is filed under News & Updates. You can follow any responses to this entry through the RSS 2.0 feed. Both comments and pings are currently closed.